Creekstone Farms Woodworking is a true custom shop. We will work with any species of wood and finish that you desire. We can assist with any drawings needed and produce sample boards of the finish for the client’s approval. We look forward to developing a long lasting relationship with you and will always respect your relationship with your client. Let our years of experience insure that your client is completely satisfied with their completed custom project. At Creekstone Farms Woodworking we are well aware of the critical timing issues and high quality craftsmanship required for today’s custom homes and remodels. Let our years of experience help you build that showcase look in all of your homes. We build, finish, deliver and install all of our cabinetry, using designs furnished by you, a designer, or created by Creekstone Farms Woodworking. We use KCDW cabinet design software which allows us to quickly design and make any changes your client desires. Our software will show floor plans, elevations, and 3D views of all spaces so your client can visualize their new design before it’s built. At Creekstone Farms Woodworking we have developed a number of individual relationships with customers looking for the absolute highest level of craftsmanship in their homes. We respect your home, and pre-build as much of our projects as possible at our shop, to minimize the disruption and installation time in your home. 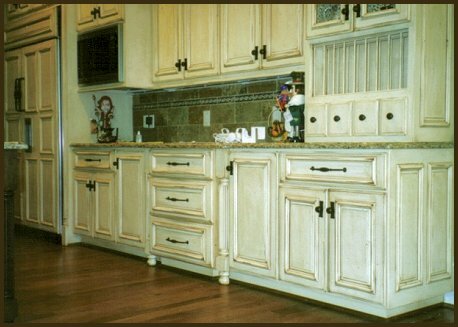 Our cabinets are built using 3/4” maple plywood boxes and shelves, dovetailed drawers, Blum undermount soft-close self-close slides, Blum clip top hinges, Sherwin Williams professional stains, glazes and colored lacquers. Our clear top coats use a catalized lacquer for durable long-lasting finish.